From a small scratch to major accidents, we can fix it. Why choose Championship Marine Repair? Your boat is an investment in your free time, and when things go wrong, working with Champion Marine Repair helps to ensure you are back enjoying the water sooner rather than later. Most boat owners take great pride in their watercraft and spend a lot of time maintaining it to look and run its best. They also understand that there are certain aspects of a boat that cannot be fixed without the help of an experienced professional. At Championship Marine Repair, we have more than 50 years of combined experience providing boat owners with a variety of services, including gel coat and fiberglass repair, transom repair, and more. In making these repairs, we use the same materials utilized by top manufacturers when making these boats, ensuring that your watercraft will be good as new when returned to you. We take pride in completing repairs correctly the first time, ensuring no one would know your boat was even damaged in the first place. The only thing you’ll have to worry about next time you’re out on the water is whether or not you have enough ice in the cooler! 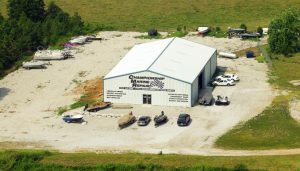 We also offer a wide range of other services for boat owners throughout Missouri. Our experienced team of repair technicians can handle flake repair, carpet replacement, detailing, upholstery repair or replacement, aluminum welding, and just about everything except engine repair. From a small scratch to a more extensive need for fiberglass repair due to a major accident, you can trust in our experience and attention to detail, as all work we complete is fully guaranteed. Those who work at Championship Marine Repair love spending time on the water as much as you do. In fact, company owner/operator, Tom Statler is a boat owner and tournament fisherman himself, which means it’s not uncommon to see him out at a weigh-in on a Sunday before heading back to the shop on Monday. This shows our total commitment to the boating lifestyle and should reassure you even more that we will go to great lengths to ensure any fiberglass repairs, transom repairs, or other services provided by our company are of the highest quality. Champion Marine Repair is the only composite boatbuilder certified by ABYC in Southern Missouri and has been highly recommended by all major insurance companies for nearly a decade. If you would like to take advantage of our fiberglass repair skills or are interested in learning more about the other services we offer, give us a call at 417-443-2628 today or stop by our shop on Highway 160 in Spokane, MO. We opened up shop in 2009 and have been growing ever since thanks to our loyal customers and high quality of work. We offer free written quotes, accurate estimates and handle insurance claims for all major insurance companies. Address: 9891 US Hwy 160 S.